As I've mentioned a couple times before, I'm pregnant, very pregnant these days. I am due at the end of September and am excited, nervous, scared, anxious, can't wait, can't believe it, have a bunch I want to do, and am not sure how/if I am going to do it all. 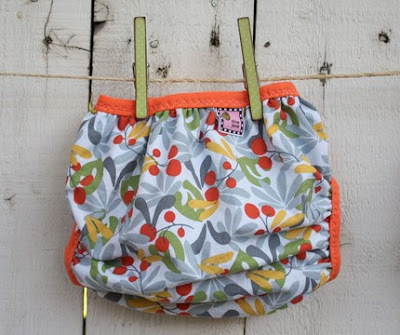 So today, as I debated on whether to head into my little crafting bungalow and get some of the stuff made for my little bambino or look at etsy for some 'inspiration' (as well as see if I wanted to just go ahead and buy some handmade stuff rather than try to make all that I wanted to make), I stumbled across these adorable waterproof diapers from Olive Jane's etsy shop. Seriously, how cute is her stuff?! I love the peas and carrots set so much, they almost make me wish I were having twins. Hopefully soon I will have some of my own creations to share with you... or maybe I will just show off some more cute stuff I want from etsy. Ha! Free font Friday is not something you will see every Friday. Just today. I just wanted to show those who aren't familiar with all of the fonts there are to download off of the internet for free some of my favorite sources. There. are. lots. And they are super easy to install on your computer. You see, in addition to me being a magazineaholic I am also kind of a fontaholic. I’m a lot of “aholics” actually. I am kind of a collector of free things and good deals. If you look around you will find that there really are a lot of free things and good deals up for grabs. The trick to picking up the habit of being a deal finder is to have discriminating taste. Otherwise you will soon find you have a lot of junk. I could go on about this, but I am sure this will be a recurring theme in this blog and will be covered many different ways in many different forms as I share with you things that I like and find. Today I want to focus on fonts... erh I mean typefaces (sorry to all my fellow graphic designers, but let's face it- most people know them as fonts). The picture above shows just a few fun fonts from my favorite website for free fonts,http://www.dafont.com/. 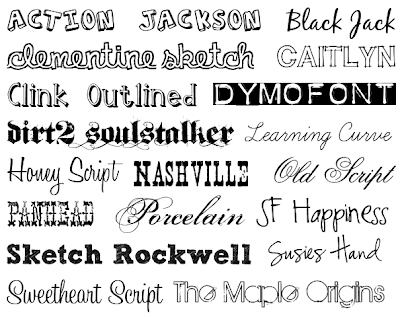 New fonts are always being added and it seems to be the most complete source for all free fonts. A good place to start looking on this site is at their top 100, but they really do have a font for anything. I also love that their site is really easy to navigate around and the fonts are easy to download. And as far as good deals go, you can find a ton of free fun fonts for cheap at Two Peas here: http://www.twopeasinabucket.com/shop/fonts/ (You can also find a few free fonts on this site). So there is my quick guide to my favorite sources. Hope you will take the time to download a few new fonts to your computer over the weekend. I promise, you will not be sorry! Are you a magazineaholic like me? Then you will love the opportunity to take advantage of some serious magazine subscription discount rates that Amazon is offering. Most of them will look like they are in the $9-10, but the discount is applied when you check out. So far, I have been able to subscribe to Real Simple, Country Living, and People Style Watch- each for $5, which is close to the price of one magazine and I generally am tempted to buy at least one issue of each of these magazines a year. How could I resist? For a complete list, click here. 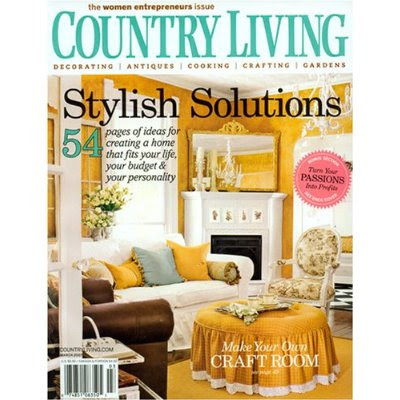 (They currently are listing Country Living, Woman's Day, Health, Bazaar, Seventeen, Parents, Field & Stream, Town & Country, Spin, Outdoor Life, Los Angeles, Parenting, Working Mother, Sport Fishing, Wakeboarding, and Wind Surfing but they seem to change it up a bit as time goes by. I bookmarked it so I could check back and see what else they offer as time goes by). I started this blog at the same time I opened up my custom design etsy shop. I was happy with how well my etsy shop did off the bat, and struggled to keep up with my life and blogging. Since then we have moved, our family is expanding, and life has been busier than we anticipated. I have put my etsy shop on hold, seeing as how we have a new baby scheduled to arrive within the month, but hope to be able to open it up again when I get into the swing of taking care of two little boys (three if you count my husband, though he certainly doesn't qualify as little). Still though, I have the desire to blog. Ideally I would like to share whatever I am up to, whatever I see that inspires me, and tips and tricks I have found and use that help me in my hobbies or just in life. Whether that be about food, fashion (what little sense I have), crafting, kids, mothering, photography, shopping, homemaking, cleaning, gardening, or some other random thing… I just love sharing information, mainly because I love getting information and would like to return the favor. Subscribing to inspiring blogs has completely enhanced my life (as long as I remember to keep the slight obsession I have in check), so I would like to give back. I hope you will enjoy visiting me often as I strive to put worthwhile things on here.